The old village is perched on a hill 130 m above sea level while the new Auribeau stretches out along the Siagne River at only 20 m altitude. To see: The 18th century church, the fortified gate (SOUBRAN gate), its flowery streets. From the orientation table, point of view on the Tanneron, the forest of Peygros, the Prealps of Grasse, the Pic des Courmettes and the plateau of Valbonne. Not to be missed: Auribeau’s cirier (handcrafted candles). This village, French since 1947 is now attached to the town of Breil Roya. Once important, it has lost its importance since the construction of the RN204 and the railroad. (Perched at 615 m above sea level, it dominates the Roya Valley). From its height of 550 m it overlooks Peymeinade and Spéracèdes. Near the church, the Mirabeau square where the castle was demolished in 1794, beautiful viewpoint of Nice to the Massif des Maures. To see: The 17th century church, the Saint Jean chapel (one of the two octagonal chapels of the Alpes Maritimes), the Sainte Marguerite chapel, the streets of the old village. The old village is 5 km from the new town. It dates from the 12th century with its castle which now hosts the “International Center of Contemporary Art”. Carros village is definitely worth the strolls of its old streets and stairs, charming and relaxing. From its 380 m, it offers a panorama of the Alps and the Mediterranean. Medieval village called “the village of the sun”, Coaraze is perched at an altitude of 640 m. From the public garden, beautiful view of the valley floor and surrounding mountains. Inside the village there are old streets with long vaulted passage. Its 14th century church and the various sundials adorning the facade of the Town Hall are to be seen before leaving. Perched on top of a cliff, it is one of the most beautiful villages in the Alpes Maritimes and one of the most visited. Many artists, art galleries and shops have invaded. To see: the chapel dating from the Middle Ages, the church of the eighteenth century, the exotic garden that surrounds the ruins of the castle and which rises to 429 m. From the orientation table, beautiful point of view of St Tropez to Italy. Built at the end of a rocky outcrop, Gourdon “La Sarazine” towers 300 meters above the hamlet of Pont du Loup, marking the limit of the Gorges du Loup. From the Victoria Square beautiful panorama on the coast, from Nice to Esterel. The castle, restored in the seventeenth century can be visited. The streets of the village welcome many artisants (art glass, perfumeries, ciergeries, paintings on silk, soaps, honey and nougats. The village is built on a rocky outcrop 350 m above sea level. The view extends over Gourdon, the gorges and the Valley of the Wolf. Its houses are grouped around the church built from the 13th to the 15th century and the castle (whose foundations date back to the 13th century), this one can not be visited. The Tourist Office is in the remains of the old dungeon demolished after the revolution. Built on a rocky peak at 650 m altitude, it has retained its authenticity. See the Sainte Marguerite church, its altarpieces and treasure, the Saint John chapel which houses the Museum of old tools, the tower and its ramparts. In the lower part of the village (not perched) almost as old as the upper part, see the chapel Saint Pierre. 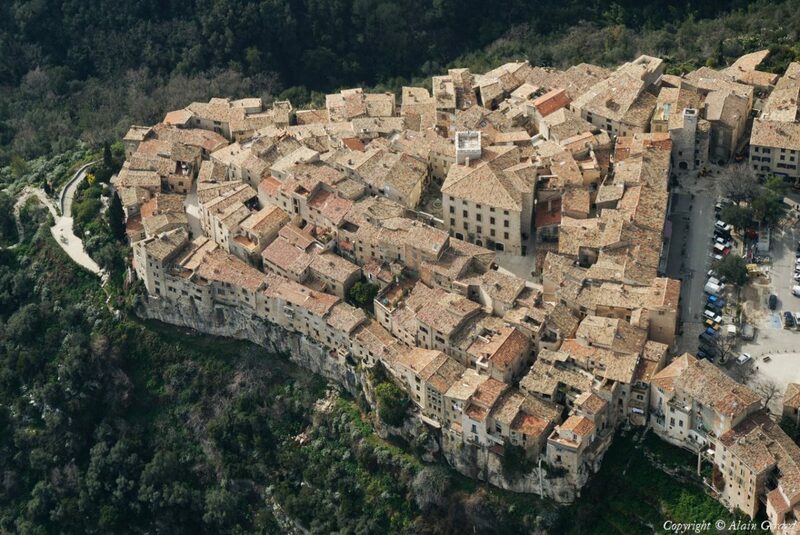 This medieval town, fortified in the Xth century is built on a rocky outcrop overlooking precipices. The Town Hall is located in the old castle and hosts exhibitions. The 12th century church has undergone several restorations, it is built outside the village. The streets of the village host many workshops and galleries (olive wood, weavers, painters, leather, jewelry, bronzes, mozaïques, pottery and fayence). To see: Confiserie Florian. In the heart of the verdant Bévera Valley, south of the Mercantour National Park, near the Italian border, Sospel is a quiet village, which triples its population in summer. Episcopal city from the fifth century, Sospel was a milestone on the royal road from Nice to Turin, also called the road salt mule, where we crossed the Bévéra on a toll bridge. Built in the 13th century, this “old bridge” still exists: rebuilt in part after the last war, it is occupied today by the Tourist Office. Built on a rocky spur, surrounded by ramparts built under François 1st, Saint Paul is the most visited village of A.M. The houses with beautiful stone facades perfectly restored home to many art galleries. Not to be missed: the royal gate, the big fountain, the church, the college, the old dungeon, the chapel Saint-Clément, the ramparts and superb views of the hills and the sea. “The glassware of art” It is in 1956 that the first glassworks is born: The glass factory of biot. Under the impulse of Eloi MONOD, a ceramist engineer, the first forms of domestic glass objects were born: carafes, glasses, goblets that were initially shaped by potters. Inspired by the work of the glass craftsmen of Venice, Mallorca and Barcelona, he created with a former glassmaker and a young glassblower a glassware: The glass factory of Biot. “The City of Perfumes” The tourist perfumeries open their doors to the public and offer free guided tours so that visitors discover an exciting experience in the mysterious alchemy of perfumes through raw materials, distillation, enfleurage, perfumer and his creations, to finish their visits in a sales room. “The oil mills, a heritage of more than 150 years …” “Historical Heritage”, the mills of Brague are located in the town of Opio, not far from Grasse. For 7 generations this country house belongs to the same family of mills that has perpetuated its art and traditions of the Culture of Olives. With strength and perseverance, the Michel family has been able to modernize its activity and develop its productivity to become one of the first 3 Millers in France. The oil is made from mid-November to the end of March as the harvest progresses. During the crushing season, guided tours take place in the mill. Opening hours: 9am / 12pm – 2pm / 6pm closed Sunday and public holidays. Annual closing: 2nd half of October. “Art ceramics” Very early on, mullet was exposed to traditional pottery called “terraille” where “pignates” are the most common production. The end of the nineteenth century corresponds to the rise of culinary ceramics that are exported from Golfe-Juan by land and sea. Vallauris specializes in cooking utensils (round pot, tail, bass, round pan … ) simply coated with a colorless varnish. Towards the middle of the 18th century a brown, orange or white slip covers the parts. Around 1920, Societe Generale offers three types of finish: “ordinary” pottery (raw earth exterior and red or light yellow enamelled interior), “varnished” pottery (yellow gold enamelled exterior and red or light yellow enamelled interior). ), the pottery “jaspée” (enameled exterior yellow lemon red or light yellow). Traditionally, these potteries bear on their paunch a number corresponding to ancestral measurements deriving from the foot and the thumb.